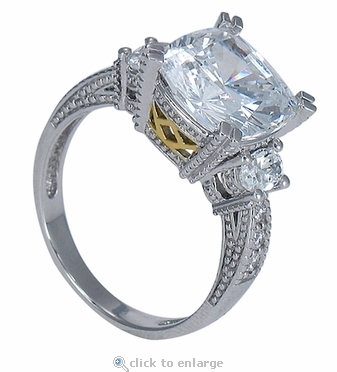 The Drotisse Cushion Cut Cubic Zirconia Oval Solitaire Antique Estate Style Engagement Ring features a 5.5 carat 10mm cushion cut square that is basket set and surrounded by a .25 carat oval on each side. This ring takes the three stone ring concept to a whole new level. 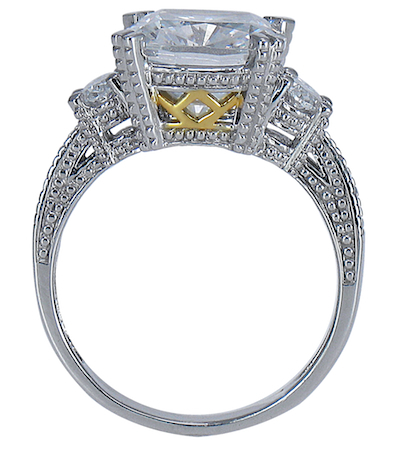 The vintage antique estate style detailing with the beaded milgrain accents, the two tone yellow gold accented lattice work in the gallery of the center stone and the split prongs on the cushion cut solitaire all add up to a serious designer look. 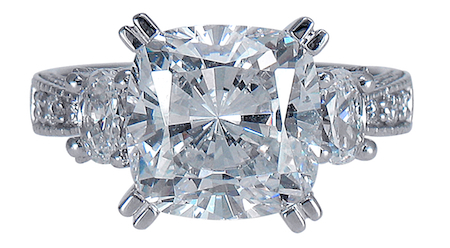 The 104 faceted cushion cut center stone, the oval side stones and the round pave set stones set down the shank are all the original diamond quality Russian formula cubic zirconia that are hand cut and hand polished. The band measures approximately 3mm at its widest point and includes over 6 carats in total carat weight of the finest diamond quality cubic zirconia available. 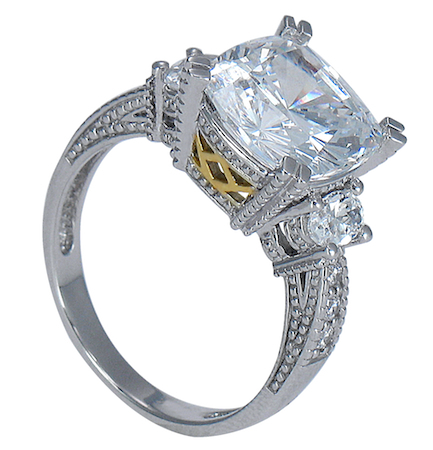 This ring can also be made in 18k gold or Platinum via special order, call or live chat us for a quote.